Gun rights advocates attend an open carry firearm rally at Dallas City Hall during the National Rifle Association's 147th Annual Meeting. Ever since two important cases struck down gun restrictions in Washington, D.C. and Chicago – rulings that essentially protected gun ownership in the home – a question has remained as to whether it's legal to carry guns in public. But now, the Supreme Court is planning to review a case dealing with that very question; it's known by the shorthand "New York State Rifle." "But you can't take that gun to another residence you might have in Upstate New York or to gun ranges outside of the city of New York, and the challengers are saying this is a violation of their Second Amendment right," Winkler says. Winkler says it's those restrictions that got the attention of the Supreme Court. But New York City's law is especially specific; Winkler says it's "highly unusual," and that no other city has one like it. The Supreme Court could simply strike down the provisions in that particular law. But Winkler says it could also go another way. "I think probably the real reason the court took the case was because the court was prepared to articulate some broader principles about the Second Amendment, including whether you can take a gun that you have in a home and take it outside of your home and transport it," Winkler says. "We do have five justices who are likely to be strong, favorable votes in favor of broad Second Amendment rulings," Winkler says. "Not because they're Republican appointees, but because most of them have made clear their views on the right to bear arms." When Justice Anthony Kennedy was still serving, Winkler says he was a more "reluctant advocate" for the Second Amendment; the court refused to hear many Second Amendment cases during his tenure. But now that Kavanaugh has replaced him, Winkler says that's changing. "I think it's really a reflection of the personnel change on the court, more than anything," Winkler says. And while Winkler says the Supreme Court won't be looking directly at Texas law to determine its decision on this case, he says there is a chance the court will help set in motion a broader trend toward gun laws that look like those in Texas. "The view of the right to bear arms that has governed Texas over the last 30 years ... that same attitude, I think is shared by several of the justices," Winkler says. "And they may find that laws that are more restrictive than the laws in place in Texas ... are too onerous and too restrictive of Second Amendment rights, and that Texas is the model for America." America's Gun Culture: How Did We Get Here And What's The Best Way Forward? The unfortunate pattern of gun violence and mass shootings are growing more frequent in American society. How did guns become such a significant part of our culture? Can common ground be found moving forward on gun policy? Experts and researchers speak on the social and legal aspects of America's connection to guns on "The Source" Wednesday at noon. Students who survived the school shooting in Parkland, Florida, joined young activists from Texas in a series of panel discussions on gun control last week. Their vision for gun violence prevention is in stark contrast with state lawmakers’ plans. 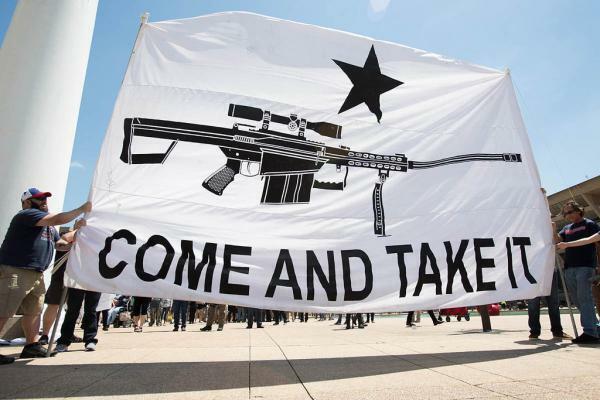 Could A 'Red Flag' Law Help Curb Gun Violence In Texas? Mass shootings in Texas at Sante Fe High School and in Sutherland Springs claimed a combined 37 lives. One shooter showed warning signs beforehand. The other seemingly did not.